1. Color coordinate everything! : The #1 thing I love about having an organized closet is that I ALWAYS know what I have. Knowing what I have prevents me from buying things that I don't need and it makes it easier to shop in my closet. Color-coordinating everything in the space is one of the best ways to always know what you have. It also makes shopping in your closet super easy. I love to wear black, so on days when I want to wear black, I just head to the black sections of my closet to shop for an outfit. That saves so much time! 2. 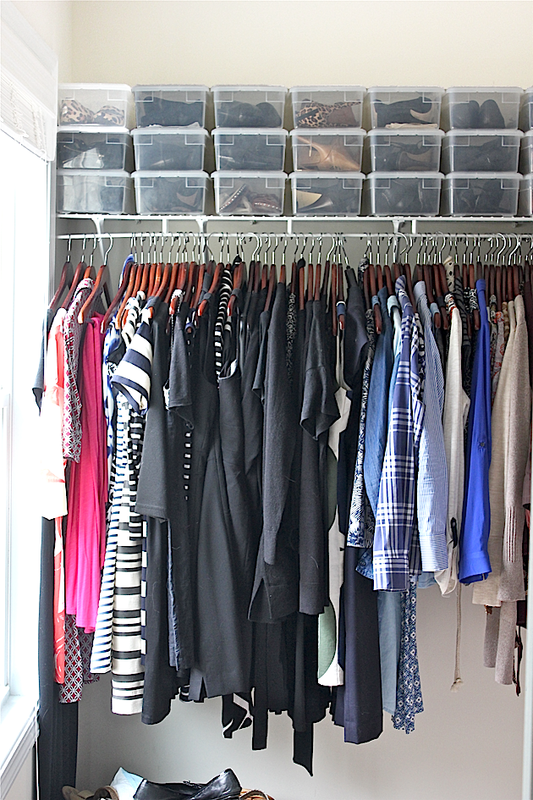 Implement the One-In One-Out Rule: I have about the same about of empty space in my closet now as I did when I first moved into the closet - which was over 7 years ago. Other than my coat closet, all of my hung clothes are stored in my closet in my bedroom - all because of this one rule. The rule simply works like this: When something comes into the closet, something comes out of the closet a goes into the Goodwill bag. So when I buy something new, I go through my closet and search for items that haven't been worn in a year and/or those items that I just don't LOVE anymore. It's hard sometimes, but I keep looking until I find something - and I always find something. 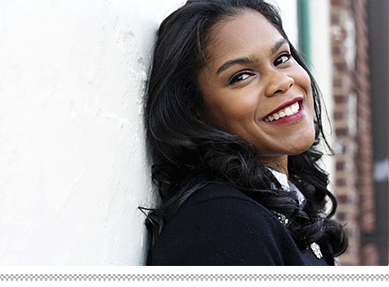 In addition to keeping my closet paired down to just those things I love and have worn in the past year, this rule helps me to always have an updated picture in my mind of what I have so I can make better decisions when I'm shopping. I apply this rule in my small kitchen as well and it works beautifully! 3. 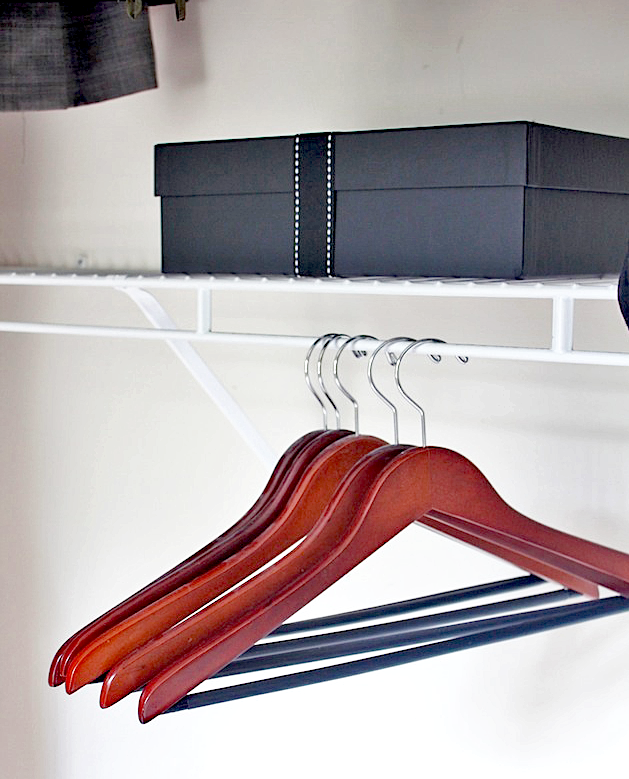 Use thicker hangers and only buy a certain amount of them: I know that thin hangers are the thing to have these days - especially when you have a really small closet or a larger one that you have to share with someone else. But hear me out... I used to use the thin hangers - even when I had a smaller closet - and it was really hard to keep up with what I had. The clothing was so scrunched up together that it was just so hard to see everything! So I went and bought a few boxes of the thicker wooden hangers. While I do have less space in my closet, I can really see what I have. The hangers make the aesthetic of the closet much nicer, too... Anything to make a builder-grade closet look better! And guess what else?? My goal is to never buy a box of hangers again. I have about 5-10 empty hangers at any given time. Once those hangers start dwindling down, that's my signal to find something to get rid of so that I can free up a hanger and keep my closet paired down. Trust me, there is always something to get rid of. You just have to enforce concepts that make you find those items on a regular basis! Note that this concept still works even if you use thin hangers. Start by pairing down your closet to only the things that you love and have worn in the past year. Save a few of the extra hangers and donate the rest. This along with using the One-In One-Out rule should be helpful! 4. Ditch the shoeboxes: Shoeboxes irritate me. They tear up easily and you can't see what's in them. Plus a whole bunch of them together isn't visually appealing. 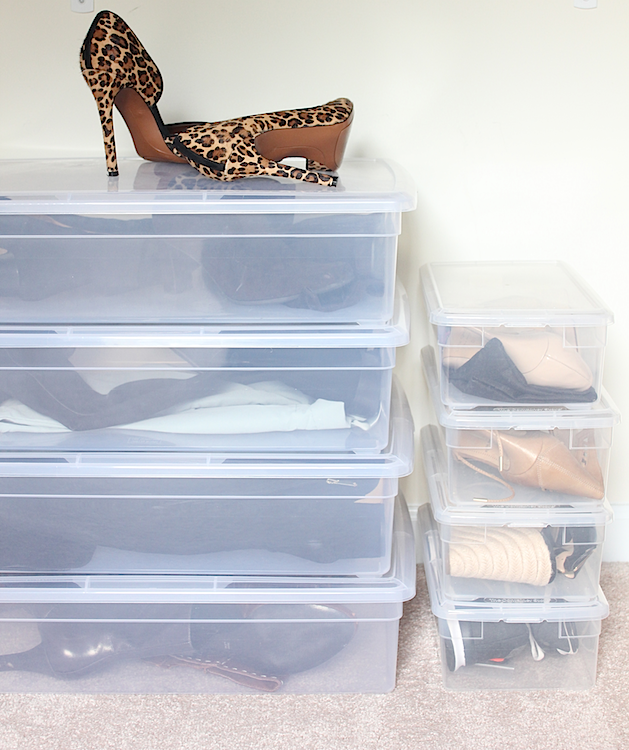 Since I don't have the luxury of shoe shelves, I invested in these AMAZING clear, stackable shoe and boot boxes from The Container Store. I can see what I have, my good shoes are very well protected, and I save a little space. I treat these boxes just like I treat the hangers. I bought so many shoe boxes and boot boxes and I'm not planning to buy any more. So once the boxes start running low, I find a pair to get rid of. I love shoes, so the search for that one pair to get rid of is often SO hard, but I do always find a pair that I haven't worn in a while or a pair that I know someone would love to have. Note that I have a small basket in my closet that holds flip flops, slippers, sandals, etc., that don't need to be protected (see bottom of first pic). I only use the boxes for my good quality shoes that need protection. If you don't have space in your closet for clear boxes, invest in a hanging bag or something that fits in your closet that will allow you to see what shoes you have. You will be amazed at how much time, space, and money you save! 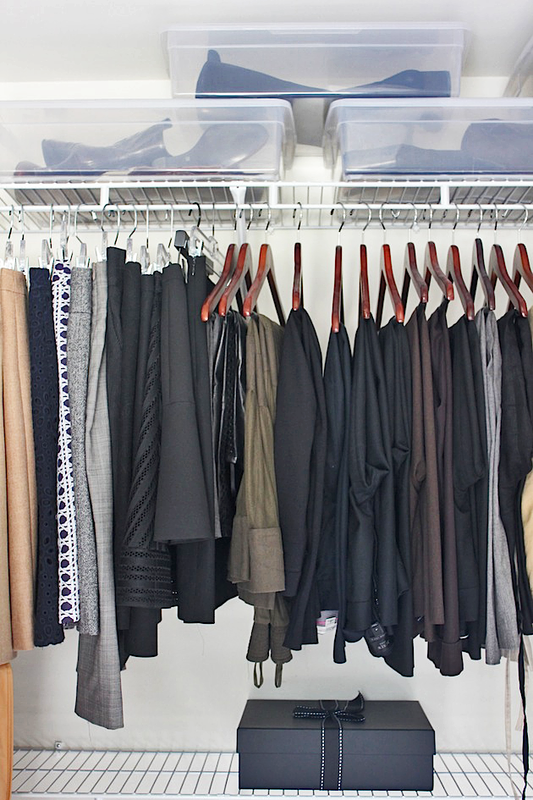 What are your methods of keeping your closet organized?? I'd love to hear! So glad you thought it was helpful! Those shoe boxes have been such a great investment for me! This is a fabulous post. I need to apply it to my closet and I am going to put it on my friday favorites! Oh I'm so jealous! I'm not an organized person by nature but I wish I was. I think the biggest battle for me (that you alluded to as well!) is to be a smarter shopper instead of buying whatever sounds good at the moment and GETTING RID of stuff more regularly. It can be quite a task right??!! I actually don't store away clothing for the season. I don't have a lot of extra storage in my house either, so I really do try to keep things paired down enough to where I don't have to switch things out. I do keep my sweaters loosely rolled in a big drawer. Rolling as opposed to folding them them can create extra space. My main suggestion is that if you are low on space and storage bins aren't an option, then keep pairing things down in your closet and other potential storage spaces to create room for the things you really need and love!